The highest of the iZone beds is the 12 " high Z3. Like the other two models, Z1 and Z2, it is billed as "simple to set up and adjust." According to iZone, a subsidiary of Boyd Specialty Sleep, this will result in "a deep, continuous, great night's sleep." iZone claims that their beds are "perfect for everyone." How is that? because the 7-zone support level can be adjusted independently for each side. With seven zones, it can be configured for short and tall people by where the lumbar support is located. This is described as a 3-way hybrid: water, latex and air. The air is not support, but temperature control. The support core has three components: a polyurethane foam base, a layer of engineered latex support foam, and oval water-filled tubes, called calibrators, inserted into channels in the latex. With a memory foam confort layer, this makes the Z3 a hybrid of latex mattress and waterbed with a memory foam mattress. The iZone Z3 has the highest base in this series. It is 6½" thick, while it is 5" in the Z2 and 3½" in ths Z1. 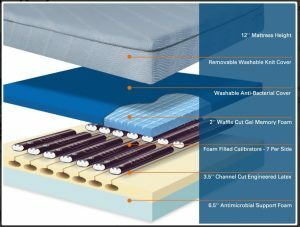 Polyurethane foam is the default support core material in most specialty sleep (non-coil) mattresses. The latex of the second support layer is highly resilient (note that this is the same as foam rubber). This makes it both supportive and conforming. Latex is also natually antibacterial. The firmness of the calibrators is adjusted by how much water is in them The more water, the firmer. Marks on the tube show what the support level is for each level of water. These fit into the channels in the latex. The channels have slits at the top to allow air to flow in for temperature moderation. The temperature-conservative water will cool or warm the air as needed. This is similar to the way phase change materials function. The calibrators are foam-filled to dampen wave action. They will still adapt to changes in sleeper positions, but not with a swishing feel as is the case with free flow water tubes. This is the way it works in a waterbed. 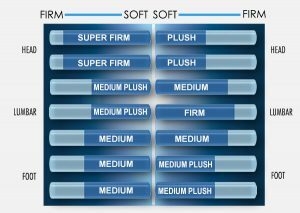 Where the Z3 really differs from the lower two models is in the comfort layer. Here the 2" memory foam is infused with gel for additional cooling. Also, the surface of the gel memory foam is waffle cut to increase airflow. The foam is guarded by a bed-bug barrier. Like the others, the Z3 has two zippered removeable covers. An antimicrobial cover protects the memory foam. and a knit fabric covers the whole mattress. Removing the cover lets the users adjust the calibrators. This can be done with the aid of iZone's izone matrix. The Z3 is available at The Bedroom Store or online at iZone. 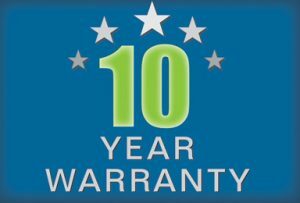 It is covered by a 90-night sleep trial period and a 10-year warranty.